This lightouse was built in 1304 after that a previous light existing since 1154 and located near Porto Pisano, a little far North, built to mark out the many dangerous shoals at its entrance had been abandoned because the small harbour started to be covered with sand. The new location was more suitable. Livorno, now and in the past a very important harbour both for passengers and merchandises, is located on the Northern Italian coasts of Tuscany, on the Mediterranean sea. The new tower, erected using natural stones, is made of two embattled cylinders for a total heigh of 47 meters, it has 11 floors reachable by a spiral staicase, cut in the thickness of the inside wall itself. On the top of its lantern there is a rotating optics giving out four white lamps every 20 seconds that can be seen at 24 miles. 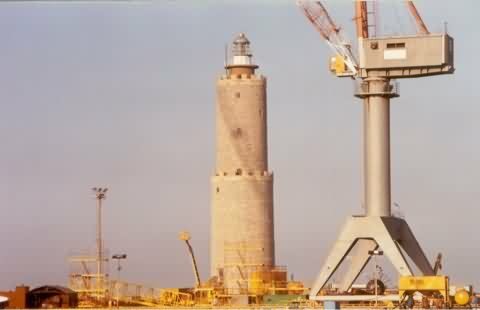 In 1944, during WWII, the lighthouse was completely destroyed by the withdrawing German forces and rebuilt in 1956 following the original design and using for the outside facing as many original stones as possible. This lighthouse is the oldest existing on the Italian coasts still in use and it has been declared a national monument. It appears this lighthouse is in the middle of the commercial shipyards. I suspect that you can best see this lighthouse from a boat. However, if you're in the area, I'll supply a map of the area with the general location of the lighthouse.